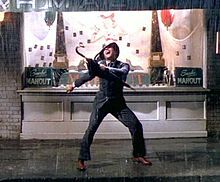 The weather is beautiful today but for some reason I am thinking about one of my favorite clips of Gene Kelly. It’s the famous “singing in the rain” scene where Gene is walking home after dropping off his girlfriend. He’s so happy that he just starts singing and dancing…in the rain. Great moves by one of the greatest dancers of American cinema. Movies reflect the values and trends of their times, and some could say that nowadays we just know more, that relationships are more difficult; that we live in more complex times. However, movies like Singing In the Rain were done in post-war America. Soldiers had come back home after seeing the Nazi death camps, the flood of refugees throughout Europe and Asia, the bombing of Hiroshima and Nagasaki, and the earth-shattering changes of a new world order. Despite all of that, simple happiness and enthusiasm were what people wanted. Perhaps because they had seen so much they knew what counted.